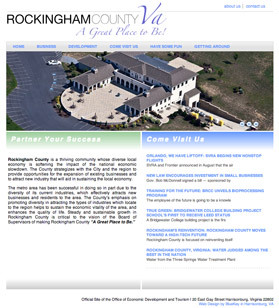 We’re happy to announce the website redesign for the Rockingham County, Virginia Economic Development website. Nestled in the Shenandoah Valley of west central Virginia along the I-81 corridor, Rockingham County is part of the Harrisonburg MSA. The website seeks to showcase the pro-business climate of the County, its research and technology park, its great transportation network, and proximity to the nation’s capital. 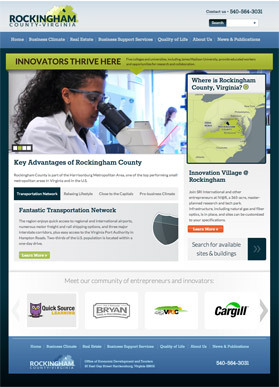 Prior to redesign, the YesRockingham.com website combined economic development and tourism functions on one website. To bring more focus to the economic development efforts of the County, the tourism information was placed on a separate website. The website was also brought up-to-date, not only from informational and aesthetic perspectives, but also in terms of technology. The website’s responsive design adjusts the website to the screen size that it’s viewed on. Visitors on tablets and smartphones see versions of the website that are slightly different from those visitors viewing the website on a computer screen. The tablet and smartphone views are easy to read and navigate on a smaller screen. Enhanced site and real estate information, where site selectors have access to a detailed database of land and buildings. Visitors can search for and map commercial real estate on a GIS map, as well as print and view parcel information. Information on the County’s business advantages, major employers, operating costs, transportation characteristics, utilities and more was brought up to date. A Business Support Services section was added to give people a step-by-step guide to starting a business in the County. Case studies of companies that located in Rockingham County tell the stories of the County’s advantages from the business’ perspective. Publications and news was added as a resource for the community and site selectors. The new website also features a content management system that makes publishing a snap, even for non-technical staff.